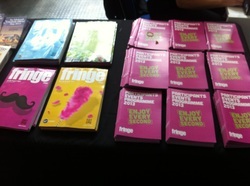 Your one-stop shop for Fringe resources. Here's where you'll find interviews (both text and audio*), a gallery of Fringe pics and ongoing lists of Fringe venues, Fringe publications and Fringe awards. Use the cool slide out menu on the left. Seen anything we've missed out? Holla!